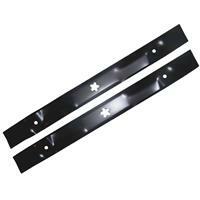 Husqvarna 38" Blade Set Part# PP24001 is a set of 2 replacement mulching blades for use with a Husqvarna 38" Lawn Tractor and a Poulan/Poulan Pro 38" deck. The individual blade part number is 193957. These blades have a star center hole. 2 blades per pack. Please check your owners manual to assure that this is the correct blade for your mower.